Our goal is to provide each customer with the best quality service. 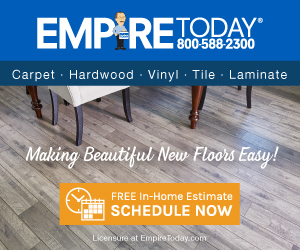 We work with our customers from start to finish to ensure that our mission of making beautiful new floors easy is achieved. We sincerely regret to hear about your experience. We appreciate your feedback, and we’ll be reviewing your concerns. Had carpet installed prior to listing our house for sale. The installers did not meet the original appointment time and when they showed up they didn’t have the proper materials and had to reschedule. During the install furniture was damaged but no one took responsibility although the contractor offered to pay for the repair. They did not vacuum, there were staples left every where and left garbage all over our yard. We had to hire someone to come back and do a second cleaning before we could list the house. No one from empire ever followed up to see how things went. I am now ready to replace the floors in our new house but don’t am very hesitant of getting a quote from them again. Review #1295473 is a subjective opinion of UppityBullock.